They are done with it. What happened to the football team at the University of Waterloo two years ago doesn’t matter anymore. It never mattered. Now it’s just focusing on the present. 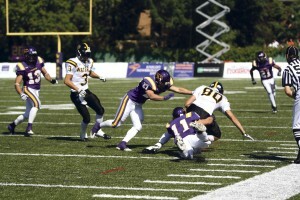 The Waterloo Warriors taking on the Laurier Golden Hawks in 2009. (File photo by Yusuf Kidwai). The university’s football program was suspended for a year in 2010 following the biggest steroid scandal in Canadian Interuniversity Sport (CIS) history, which saw former Waterloo Warrior Nathan Zettler arrested for possession and trafficking of anabolic steroids. Nine other athletes were found with positive urine samples following an investigation. Returning to the game in 2011 with a demolished roster, Waterloo found themselves in the bottom of the standings, finishing 0-8 on the season. Matt Vonk, a Warrior offensive lineman, will be the first to contest that the past needs to stay where it is. Vonk returns to the Waterloo lineup this season after a controversial call by the CIS name him ineligible to play last season. Vonk, who tested clean during the scandal, transferred to Wilfrid Laurier University as a visiting student in 2010 to play football during the cancelled season. The CIS waived the standard rule that dictates any transferring players need to sit out a year before joining a new team. This allowed the majority of the Waterloo roster to play for other teams immediately, with Vonk and seven others landing at Laurier. 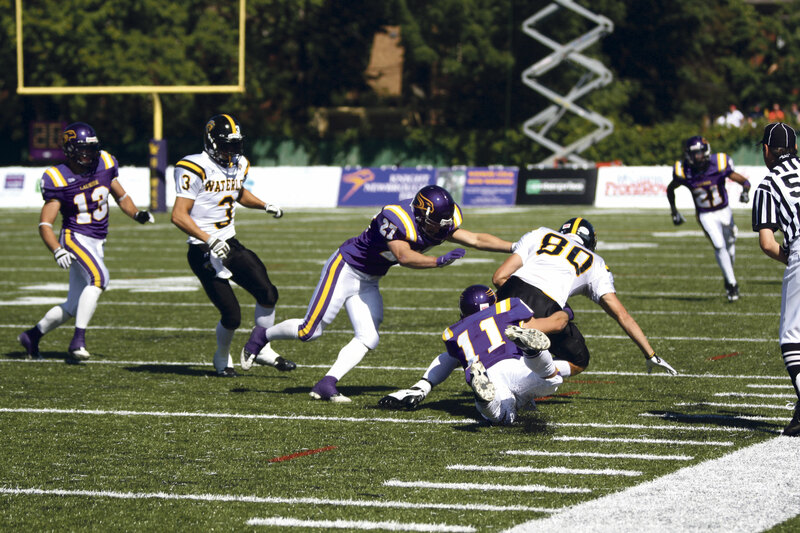 After a year with the Golden Hawks, Vonk found himself in a situation where none of the classes available at WLU would help him move towards his degree. So the 6’4, 285 pounder transferred back to Waterloo full time. Only this time around, the CIS did not waive the transfer rule as they did in 2010. When Vonk returned to UW, the fourth-year kinesiology student was declared ineligible and was sidelined for the season. But that doesn’t matter to him anymore. Two years later, the Warriors hit the field in a controlled scrimmage against the cross-town rival Laurier Golden Hawks Aug. 26, with mixed results. According to Paopao, the team’s effort has improved substantially since the beginning of training camp. The head coach is focusing on a positive environment that will set the athletes toward a developing year, but the team still needs to tweak the final touches before their season opener versus Western on Sept. 3. “We’re pleased with the overall effort — until I watch the film. Maybe then I’ll have a different viewpoint,” Paopao laughed. With almost 80 per cent of their roster being first and second-years, Waterloo will rely heavily on their few veterans, such as Vonk, running back Marco Visentin and linebackers Joe Surgenor — who has just finished serving a two-year ban as a result of the 2010 steroid scandal – and Spencer Bradbury. But the goal remains the same. “As long as we have a vision. How do we get there? It might take us some time. But we know that’s where our eyes are,” Paopao said. As for keeping the players focused on the task at hand and not the past that haunts them, Paopao thinks that’ll be no problem.